Despite the run-up from a $33 share price earlier in the year to just over $40 today my stock screener absolutely loves AT&T (NYSE:T) on value and quality at the moment. Let’s start with the latter, which basically boils down to earnings that are supported by huge scale advantages owing to the intrinsic nature of AT&T’s telecoms operations. To muscle in on the telecoms market you’re talking about running the gamut of huge capital expenditure requirements because of the necessary infrastructure; dealing with government regulations; developing customer relationships; and so on. It’s something that requires billions upon billions of dollars in terms of investment. The result is that they are a classic case of an oligopoly. Between AT&T and its peer Verizon we’re looking at about 274 million domestic wireless customers – equivalent to over two-thirds of the entire US wireless market. Typically the deal with these stocks is that in exchange for being part tech, part utility you get a mixture of low growth that is somewhat balanced by lower valuations and juicy dividend yields. The domestic cell phone market for example is pretty well completely saturated: everyone in the US that wants or needs a cell phone already has one. That, plus the fact you have very dependable cashflow, is pretty much why these stocks get seen as bond proxies and are favorites with income investors. The other thing to bear in mind with AT&T is that the low-growth/high-yield combination actually meant that recent total returns have also been pretty decent as well. 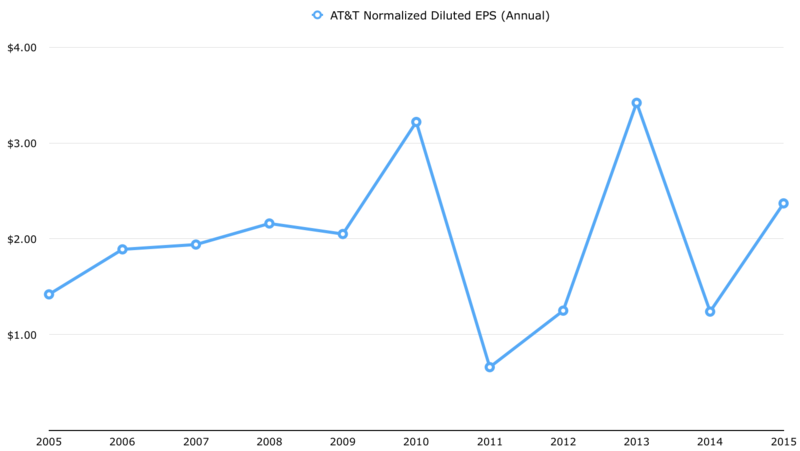 For instance, between the start of 2006 and the end of 2015 AT&T stock generated compound annual returns of around 9% assuming dividends were reinvested. By comparison the Dow Jones Industrial Average, of which AT&T was a member until 2015, returned 7.4% over the same time fame (again assuming dividends were reinvested). That level of performance was primarily down to reinvesting those chunky dividends at fairly “low” valuations, with only a smidgen of earnings growth contributing to it. In fact earnings per share growth has only clocked it in at around 1.4% annually over that ten year period. What makes AT&T attractive right now is that you’ve actually got two decent long-term growth drivers: the Mexican wireless expansion and last year’s $48.5 billion acquisition of satellite television provider DirecTV. The latter gives AT&T just under $3 billion in additional net income straight off the bat. In the case of Mexico you’ve got some decent growth catalysts in that the Mexican cell phone market, and specifically the smartphone market, is not as saturated as the domestic United States market. Throw in some additional stuff like attaching DirecTV to wireless data plans and you’ve got fairly good growth prospects in terms of a stodgy telecoms behemoth. In fiscal year 2016 the company are going to make something like $2.85 a share in net income according to consensus estimates among analysts. In addition stockholders will probably receive a dividend pay-out of $1.92 a share. In other words the shares are trading at 14x annual earnings along with a 4.8% dividend yield – pretty much in line with their ten year historical trading average. Considering we’ve got two potential growth drivers on the horizon that seems an attractive place to be. At the very least the downside appears to be quite minimal when you’re picking up a near 5% dividend yield. It might seem strange to talk about growth in what is basically 40% of the old Bell System monopoly but you’re shooting low enough that even very modest growth will look attractive. A key point to bear in mind though is the balance sheet situation. As a result of both the hefty capital expenditure requirements and the acquisition of DirecTV the company has seen its debt levels rise considerably. Between 2010 and 2015 total debt pretty much doubled from $64.5 billion to $126 billion. As a percentage of capital it has gone from 37.5% at the start of the period to around 50%. How will that play out on a cashflow basis going forward? Well, let’s take management estimates of $20 billion in annual free cash flow by 2020. A 2016 dividend of $1.92 per share represents about $11.8 billion for the year in cash outflow. That means realistically you could expect dividend growth to at least match its recent rate of 2% a year to 2020 (that’s over a five year stretch and barely in line with inflation) and still be healthily covered by cash flow. I’d say that is a fairly conservative estimate as well. Over the past ten years the dividend pay-out ratio has averaged about 69.5% of net profits, and since 2008 it has been even higher at about 73.5% of net profits. Assuming that conservative 2% dividend growth rate, and that earnings come in as expected, you’re going to be looking at that ratio potentially coming down to around the 60% mark in the next few years. If that is indeed the case, then the company would have more than enough to pay down debt at a meaningful rate. It will also mean that, at the very least, investors are looking at collecting $10 per share in cash dividends during that period – or about 25% of the initial starting capital if you include the full dividend for 2016. That’s an absolute minimum assuming very conservative dividend growth. Considering the historical trading range of the stock is between 12.5x and 15.5x earnings that seems to me to be a pretty good deal. It’s currently right in the middle of that range, the key difference being that there is arguably a much greater growth outlook than at any point over that time. The good thing is that even if that growth is somewhat disappointing the valuation means you don’t have to deal with the downsides of high investor expectations.